This is the general public’s entree to the PGA Championship at Valhalla this year. I am extremely grateful to have spent a rain-soaked Friday at the PGA Championship at Valhalla Golf Club outside Louisville, Kentucky. Despite the soggy conditions, I can’t help but feel like it was a real privilege to watch the greatest golfers in the world compete for a championship in my home state. The day provided so many great memories and experiences that I plan to spread my thoughts and impressions across several different columns. My overriding thought on the day is that Valhalla is an absolutely fantastic venue from which to watch a championship golf tournament. As you enter the Valhalla grounds, you are greeted by a “great lawn” featuring tables, chairs, concessions, and a giant HD television screen. The playing surfaces, overall Valhalla property, and fan experience elements were all top-notch, even under less than ideal weather conditions. That the tournament staff have streamlined and nearly perfected the championship experience should come as no surprise. Valhalla is no stranger to hosting major golf tournaments, having hosted the 1996 and 2000 PGA Championships, the 2004 and 2011 Senior PGA Championships, and the 2008 Ryder Cup, among others. 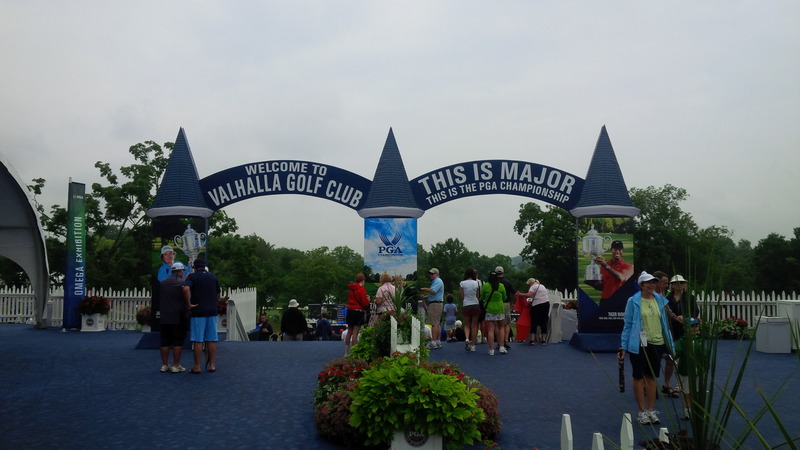 All this relatively recent tournament experience paid off this year, as the first thing I noticed was how organized and orderly everything was at Valhalla, and all without an air of snobbery or condescension from the powers that be at the club. Despite the throngs of crowds following the marquee groups, there was plenty of room for everyone to have a great view of the action. From the moment I got out of my car at the public bus shuttle parking lot, everything was easy, relaxed, and well-coordinated. Crowds moved at a quick but orderly pace. Directions to, on, and around the course were easy to find. Lines were relatively short. Perhaps most impressively, despite massive crowds in the afternoon, there were only one or two bottlenecks where crowd control and movement really bogged down on the entire Valhalla property. Tournament volunteers, security, and even uniformed police officers were plentiful and generally helpful and pleasant to deal with. The property and course routing at Valhalla are shaped by Floyd’s Fork and several streams and creeks flowing across and around a series of steep hills covered by thousands of majestic, mature hardwood trees. No one would mistake Valhalla for Augusta National, but I can attest that the only flat spots on the entire Valhalla are found on a few select fairway landing areas. The bunkers, tiers, and undulation shrunk Valhalla’s enormous greens, even for PGA Tour professionals. Many of the fairways leading to the extremely large but incredibly undulating greens are framed by hills and mounds that form an almost uninterrupted collection of natural amphitheaters that are ideal for fans. Tall or short, young or old, part of a group or a solitary observer, the hills of Valhalla allow everyone to have a great view of the golf course. Moreover, one of the best features of the Valhalla property, from a fan perspective, is that with only a few exceptions, the hills and valleys of the course allow you to view two or more holes simultaneously from almost any spot on the course. 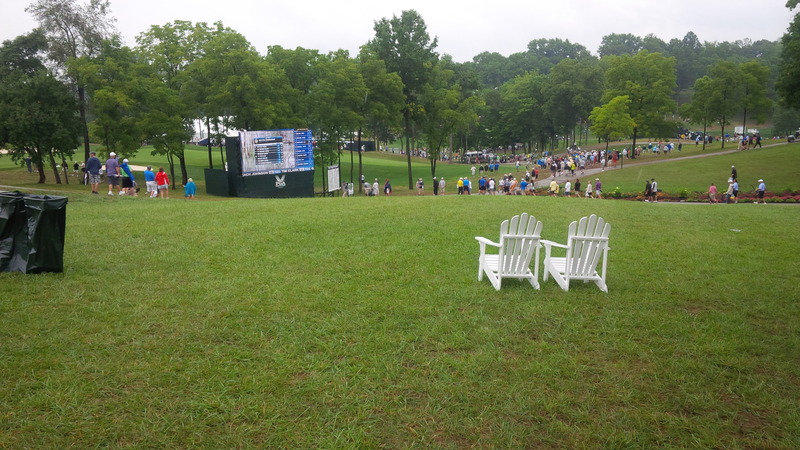 More interesting, to me, is just how well the hills and trees trap and recycle the roars of the crowds, sending the crowd’s electricity around Valhalla from disparate parts of the course, much like Augusta National. From my perch behind the 14th green, I could also see the 14th tee, 13th green, 15th tee, and 16th green. 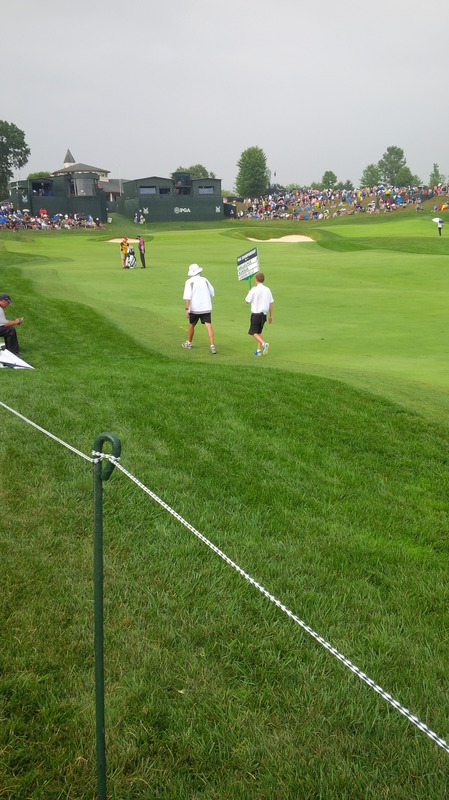 I’m sure this comes across on the telecasts to some degree, but experiencing a roar coming from a nearby but unseen corner of the golf course really did raise the hair on the back of my neck on more than one occasion. And, of course, there is the actual golf course, which is in nearly mint, perfect condition this week. The 1986 Jack Nicklaus design contains a great mix of knee-knockingly difficult holes, attackable birdie holes, and plenty of risk-reward decision opportunities. The course is long, but from what I watched, the elevation change and contours of the greens and bunkers were the main defenders of par. Given how much rain the course has experienced during Championship week, it is a much different, more attackable course than if Louisville were experiencing it’s typical dry, 90+ degree August dog days. The television cameras don’t do justice to how lush the course is, or just how much elevation change there is on every, single hole. The tees and fairways were lush and green, which the week’s intermittent rain showers will only help keep green and growing. Despite the periodic deluges, other than a few incidents of casual water collecting on a few fairways and greens, the course was able to absorb all of the water and allow play to continue. 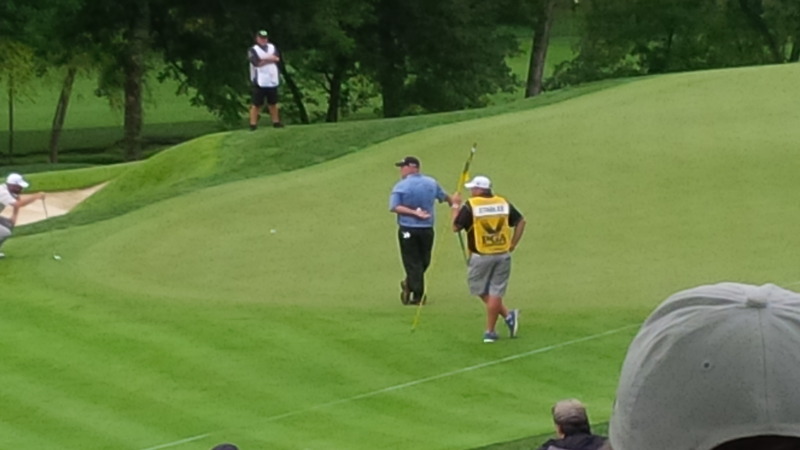 On a damp, relatively cool day, my mind could hardly process what my eyes witnessed on the greens. I have no point of reference to describe how fast the greens were at Valhalla on Friday, except to say it looked like the players were putting on bowling lanes. Almost invariably, it looked like the professionals were just barely tapping the ball. I expected every one of their putts to stop halfway to the hole, but each time, the ball made its way to the hole, or somewhere close thereto. I’ll write more later about my observations as to the actual tour players I watched play and how similar and different the game they play is to the one I play. However, after seeing where the pros tee off from on a couple of holes, I realized they play the game from a very different place than I am capable of playing from. I’m confident that if I were to tee it up from the championship tees at Valhalla today, I would shoot exactly 144…because that is the maximum score I think the Equitable Score Control feature of my USGA Golf Handicap Index Network would allow me to input into the system. The hills surrounding the 18th green ensure that the guys in the TV tower aren’t the only ones with a fantastic view of what should be a dramatic finish to the tournament. Nonetheless, as terrifying as the prospect of playing Valhalla from the professional tees may be, it’s an even better venue to watch a golf tournament. It’s a hard, hilly walk, but the course is actually very easy to get around and a real treat for an unapologetic golf fan. During the telecasts of the PGA Championship, you will be reminded at least once that the PGA of America purchased and owns Valhalla Golf club. 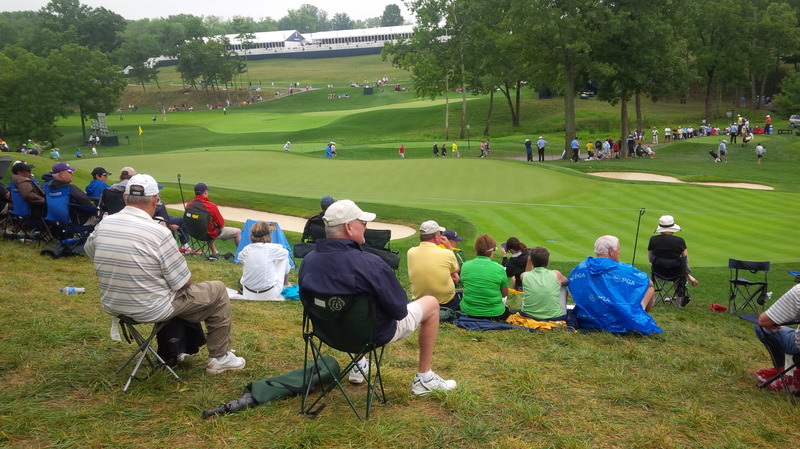 Having been there now for two different tournaments (2004 Senior PGA), it is easy to understand their reasoning for wanting to acquire a venue so ready-made for hosting championship golf. There are elements of a TPC Scottsdale cocktail party-esque atmosphere at Valhalla, but the drama that the course itself builds seems to keep the focus on the tournament action. 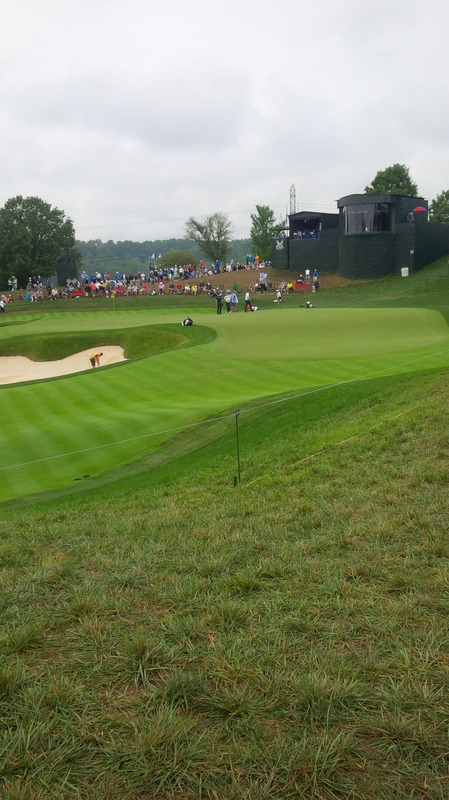 The 18th green at Valhalla is as dramatic as the tournament that will conclude there on Sunday. 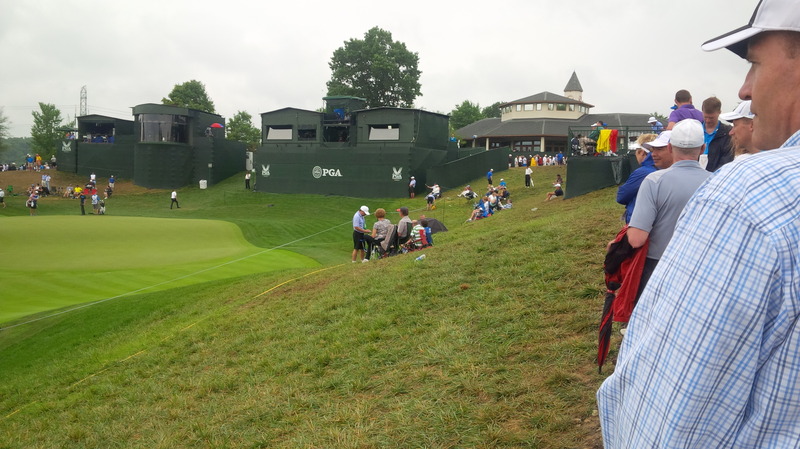 Short of being a member of a golf club that is hosting a major championship, I have a hard time imagining a better fan experience than the one available at Valhalla. If you’re able, I can definitely recommend that you try it out for yourself the next time the PGA tour comes to Valhalla. Awesome article! Wish I was there as well. Sounds like you had a fantastic time! I am jealous!